There are effectively three broad phases to the history of Brisbane Roar in the A-League – the pre-Postecoglou era, the Postecoglou era, and the post-Postecoglou era. Their poor results and performances in the phases without him illustrate how important he was to their incredible success during the October 2009 to April 2012 period, and it’s up to Mike Mulvey to buck the trend. Appointed midway through last season after Rado Vidosic’s disastrous, short-lived tenure, Mulvey’s mantra in the off-season has been all about restoring “the Brisbane way” – and the return of Matt McKay as marquee is a step in the right direction. His importance will be twofold: he’ll provide technical quality, but also, the leadership and fierce drive to succeed that is so important within winning sides – something Mulvey hinted the side lacked last season, perhaps a hangover after winning back-to-back Championships. The revamped midfield trio – after Mitch Nicholls’ and Massimo Murdocca’s defections to Melbourne, it now no longer features any ‘Postecoglou’ players, although Luke Brattan is arguably one, having been brought in under the former coach and touted by Postecoglou himself as one of the “best passers I’ve ever seen.” It’s easy to see why: Brattan’s long-range passing is outstanding and he’ll drop deep to collect possession unchallenged. Liam Miller, meanwhile, is a clever deep-lying midfielder and should prove perfect for transitioning defence into attack. Thomas Broich, meanwhile, will start on the left but drift inside quickly to become a fourth central midfielder, which helps control possession. It does mean, however, that Shane Stefanutto must provide width on the overlap. The relationship between him and Matt Smith is understated, but important – the captain slides out to cover the vacated left channel excellently. The swoop mid-season for Jade North adds valuable depth, with him and the captain battling promising youngster James Donachie for starting time. Jack Hingert, meanwhile, has benefitted from Ivan Franjic being moved further forward. While Brisbane’s first team is extremely strong on paper, there’s concern about depth, especially in attack. Besart Berisha will again be the central striker, and his work rate to lead the pressing in again be important, but like last season, there’s no natural replacement for him within the squad. Kwame Yeboah has performed well in pre-season, but is unproven at this level. It’s a similar problem out wide. 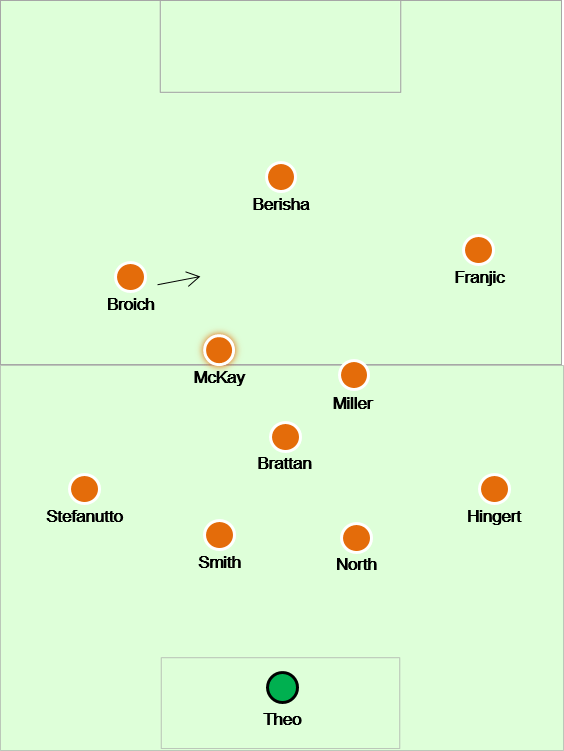 Thomas Broich and Henrique are a familiar combination on the flanks, with Ivan Franjic set to continue his surprise redeployment as a right winger (and has even featured in central midfield), but again, beyond that, it’s concerning. Dimitri Petratros is yet to convince, while Julius Davies fell out of favour remarkably quickly, and was demoted to the youth team – it’s neither quality, nor quantity.